Ms Hrabe describes her business as a one-stop personal concierge that “gives back the gift of time”. Working up to seven-days-a-week, 14 hours a day, Nicolle Hrabe had little time for anything other than eating and sleeping. It made her wonder how people juggling high-calibre jobs and family got it all done. When Ms Hrabe left her job in corporate events at the Titans basketball club she toyed with ideas for starting a business that might ease some of the pressure. “I decided I wanted to help people who were in the same position as I was in,” she said. 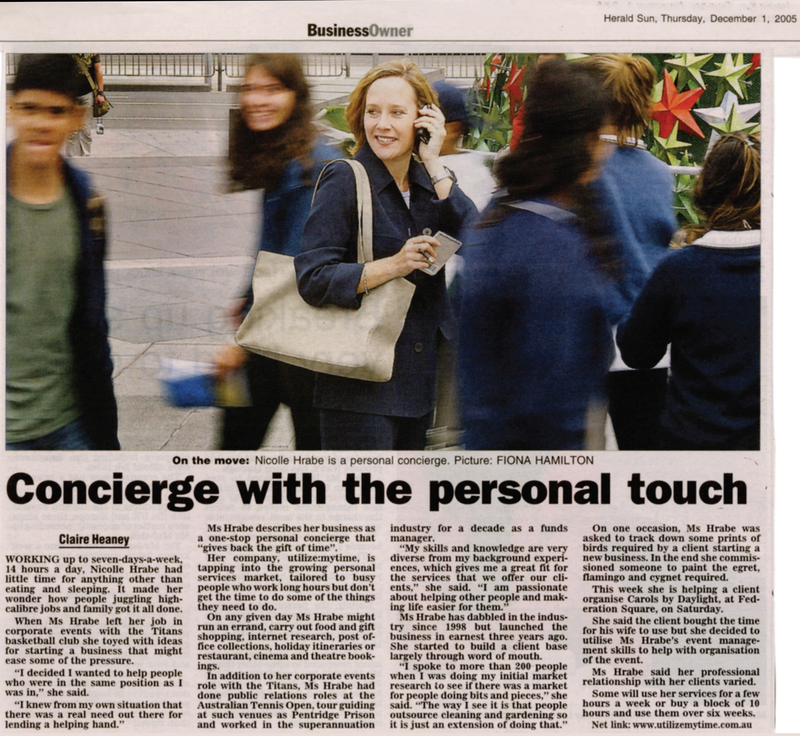 “I knew from my own situation that there was a real need out there for lending a helping hand.” Ms Hrabe describes her business as a one-stop personal concierge that “gives back the gift of time”. Her company, utilizeMytime, is tapping into the growing personal services market, tailored to busy people who work long hours but don’t get the time to do some of the things they need to do. On any given day Ms Hrabe might run an errand, carry out food and gift shopping, internet research, post office collections, holiday itineraries or restaurant, cinema and theatre bookings. On one occasion, Ms Hrabe was asked to track down some prints of birds required by a client starting a new business. In the end she commissioned someone to paint the egret, flamingo and cygnet required. This week she is helping a client organise Carols by Daylight, at Federation Square, on Saturday. She said the client bought the time for his wife to use but she decided to utilise Ms Hrabe’s event management skills to help with organisation of the event. Ms Hrabe said her professional relationship with her clients varied. Some will use her services for a few hours a week or buy a block of 10 hours and use them over six weeks.